aerSleepTM is the first solution of its kind to treat obstructive sleep apnea. 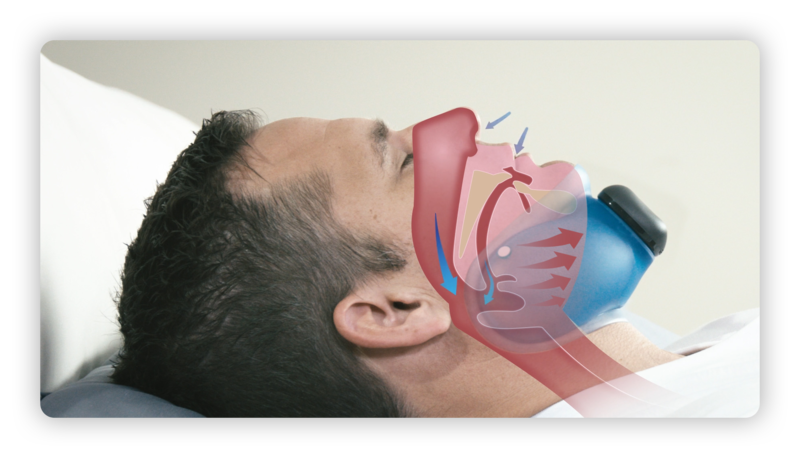 aerSleepTM is the first fully integrated, non-invasive solution to treat obstructive sleep apnea (OSA). It’s a simple, easy to use, portable device for home and travel. aerSleep safely and effectively opens the airway so you get a great night’s sleep at home or on the road. It’s an ideal solution for non-compliant CPAP users wanting a more convenient sleep therapy option. aerSleep consists of a comfortable, flexible silicone rubber collar and a small, lightweight, quiet air pump that automatically regulates and maintains therapy. Using it is easy. Simply place it under your chin and it will gently open your airway. aerSleep was approved by Health Canada on June 08, 2017 to treat OSA. It is a Class II device that requires a prescription from a physician. The license name and number is aerSleep and 99285. aerSleep is currently available only in Canada. aerSleep uses aer+TM technology (formerly known as cNEP), which is our patented technology that uses the application of negative external air pressure on the outside of the neck to gently open the airway. aerSleep is a simple to use, non-invasive external airway device that effectively and safely reduces the number of apnea and oxygen desaturation events. A clinical study was conducted at the Toronto Sleep Institute in Toronto, Ontario, Canada, utilizing aerSleep to treat patients with mild, moderate or severe OSA, and measuring efficacy through two in-lab polysomnographs (PSG). Conclusion: aerSleep was found to be both safe and effective in delivering treatment to subjects with mild, moderate or severe OSA. “Evaluation of Continuous Negative External Pressure (cNEP) for the Treatment of Obstructive Sleep Apnea: A Pilot Study.” August 2017. J Kram et al. Subjects with documented OSA were recruited from the patient population at one sleep clinic. The intervention was application and titration of cNEP during overnight PSG. cNEP appeared to be safe and effective during short-term use in subjects with OSA. “Submental negative pressure application decreases collapsibility of the passive pharyngeal airway in nonobese women.” April 2015. Kato S et al. Negative external pressure (NEP) application to the submandible region improves pharyngeal airway collapsibility. Conclusively, application of submental negative pressure was found to decrease collapsibility of the passive pharyngeal airway in nonobese Japanese women. aerSleep is manufactured in the United States by Sommetrics and distributed in Canada by AvantSleep. aerSleep is intended for use in maintaining an open, upper airway in adults diagnosed with obstructive sleep apnea. To order aerSleep, please contact AvantSleep at +1-800-209-2841 or aersleep@avantsleep.com.